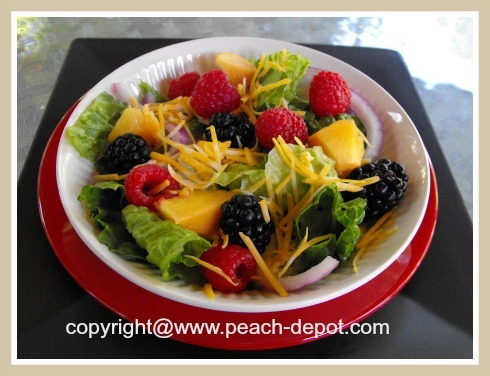 This Peach Lettuce Salad Recipe includes berries to make a healthy, leafy green salad with fresh fruit! Peaches, raspberries and blackberries combine to really take your taste buds for a ride! Check out the picture of this salad recipe (below) ... Can you believe how COLOURFUL this salad is? Who would have guessed that green leafy salads could look and taste this good? You can make the accompanying Salad Dressing Recipe (below), or use another salad dressing of your choice. In a large bowl, or in four individual salad bowls or plates, combine the chopped lettuce, the sliced onion, and grated cheese. Add the fresh peaches, raspberries and blackberries. Whisk all the salad dressing ingredients together in a small bowl. Note - Add the dressing to the salad just prior to serving. GO to Raspberry Depot for over 250 raspberry recipes ... a website devoted to ALL Raspberry Recipes! Most people know that fruits such as peaches, raspberries, and blueberries are nutritious and provide many necessary and important vitamins and nutrients for the body. However, did you know that these fruits are also important to include in your diet because they are high in antioxidant activity? Foods which are high in antioxidants are important because antioxidants are believed to help prevent and repair oxidative stress, a process that damages body cells and has been linked to the development of diseases such as cancer, heart disease and Alzheimer's disease.